Piero Fornasetti is referred to as the “designer of dreams”, and his visual universe of surrealism-tinged illustrations is instantly recognisable. He was also a purveyor of furniture and other objects that blurred the boundaries between art and design, long before such an idea took flight elsewhere. 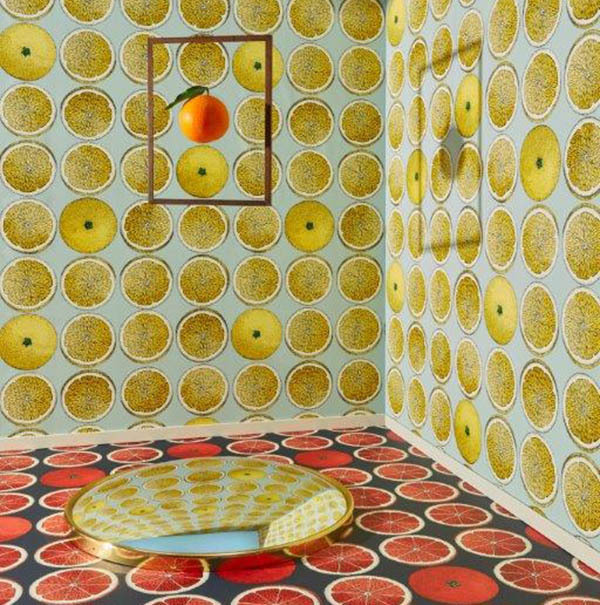 Cole & Son’s Senza Tempo collection is the fourth time that the two brands have collaborated, keeping Fornasetti’s legacy current with some patterns adapted from existing designs (but never available before as wallcoverings), and others re-coloured, given a change of scale or otherwise reimagined. The results include ‘Arance’ (pictured) with its motif of repeated citrus fruits originally seen on a 1950s design for a tray; ‘Cocktails’ a trompe-l’oeil depiction of endless bar-shelves of glasses, spirit-bottles and shakers (originally a design for an ice bucket); and ‘Nuvolette’ a scaled-down version of the iconic ‘Nuvole’ mural of scudding black-and-white clouds. Designers and architects mining the translucent potential of onyx should head to Via Arkadia (Tiles). 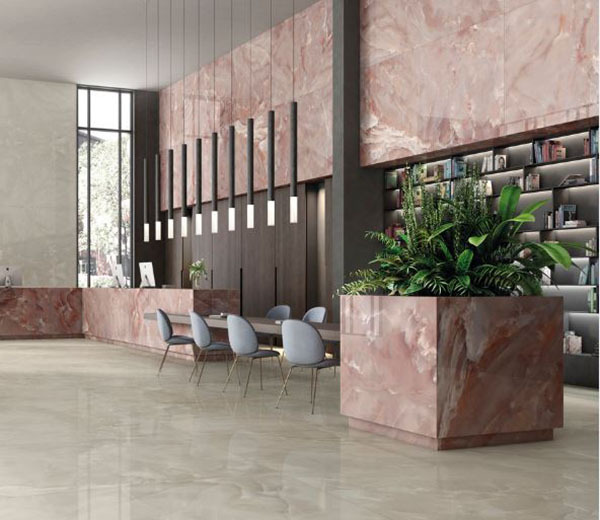 Replicating the stone’s natural character and beauty, large scale porcelain slabs from the SlabLab collection are available in sizes up to 150 x 300cm with a minimum thickness of 6mm. Shown here in pink, it speaks of sophistication as eloquently as marble. 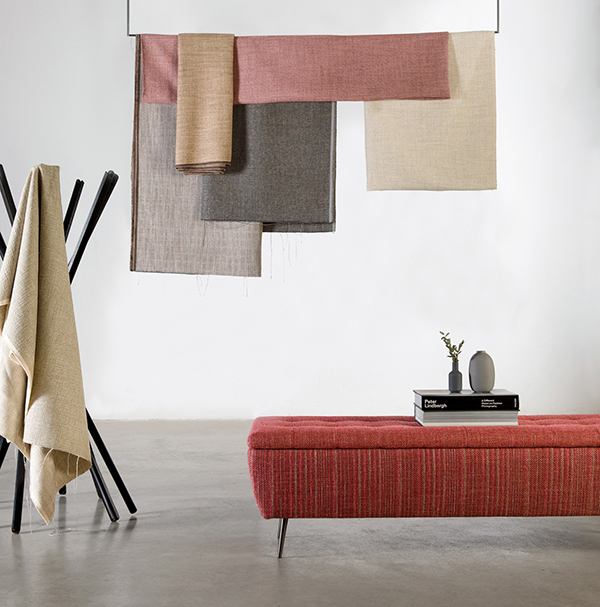 With its eclectic approach to design, Mulberry Home enjoys a reputation for craftsmanship and individuality. 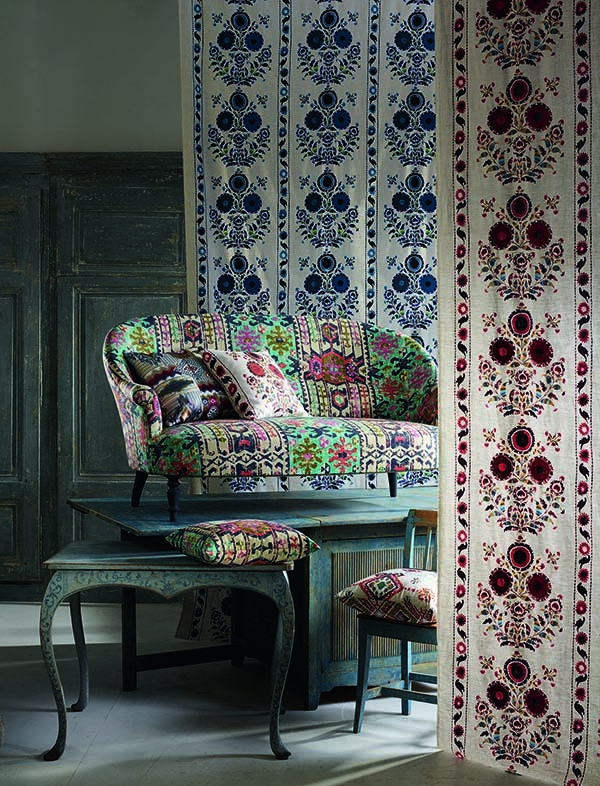 Modern Country sums up this ethos, with its sumptuous garden florals, printed velvets, embroideries and heavily textured stripes. 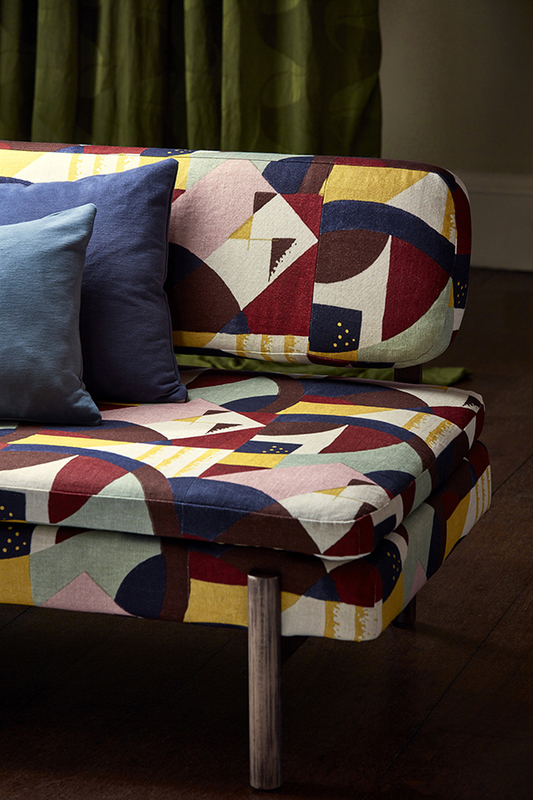 Pictured are ‘Petersham’ linen (suspended in foreground and background) and ‘Kliver’ (on sofa upholstery), a faded abstract design; both have a bohemian elegance that illustrates the playful aesthetic that is in the ascent. 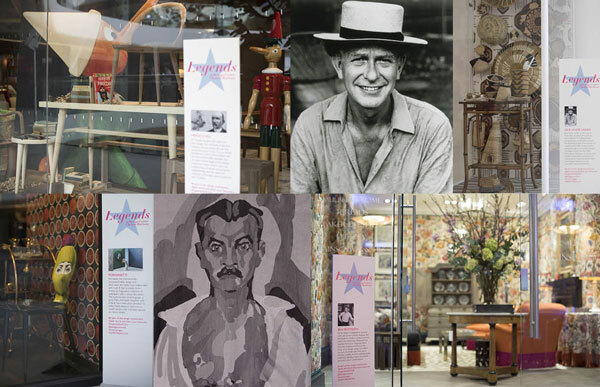 ‘Legends’ at London Design Week 2019 sees showroom windows and showcases dressed in their finest, expressing all the sophisticated glamour of the prevailing mood in design. The initiative celebrates collaborations, and for many, inspiration is provided by the photographic archives of Iconic Images. Through the lens of international photographers, images featuring luminaries from fashion, rock, film and the arts are creatively matched. 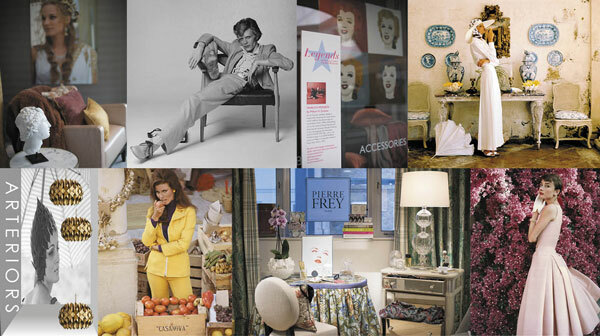 A roster of renowned interior designers includes Sophie Ashby, who has been inspired by a bold portrait of Bianca Jagger for George Spencer Designs; US design duo Yabu Pushelberg incorporates an image of film star Michael Caine at SA Baxter Foundry & Design Studio; Turner Pocock has looked to an alluring photograph of film star Ava Gardner for Tissus d’Hélène’s showcase, while Henry Prideaux partnered with Fox Linton, incorporating a stunning image of British model Twiggy. 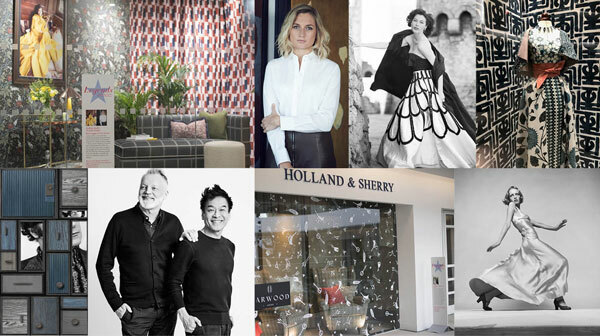 Further designer collaborations include Alidad with Tim Page Carpets, Hirsch Bedner Associates with Decca, US decorator Cortney Bishop with Holland & Sherry; Paris-based Bambi Sloan with Houlès and Interiors etc with Nobilis. Phillip Jeffries, Arteriors, Gladee Lighting and Perrin & Rowe chose fashion images by legendary photographer Norman Parkinson while Pierre Frey selected a close-up of Dorian Leigh by Milton H. Greene for its boudoir scheme. Others were inspired by photographs of Hollywood stars including Raquel Welch at Abbott & Boyd; Diane Kruger at Colony; Marilyn Monroe at de Le Cuona; Elizabeth Taylor at Topfloor by Esti and Sean Connery at West One Bathrooms. Singer songwriter PJ Harvey is the inspiration for Altfield’s window while Julian Chichester choose photographs of David Bowie by Terry O’Neill. Others have been inspired by art and literature. They include pioneering artist of the Vienna Secession movement Koloman Moser for Backhausen at Colony; Fornasetti at Cole & Son; fictional children’s character Pinocchio at Porada; and contemporary glass artist and lighting designer Jaroslav Bejvl at Gladee Lighting. Vaughan pays homage to legendary sculptor and artist, Alberto Giacometti while Porta Romana celebrates four influential female artists: Barbara Hepworth, Gillian Ayres, Lucie Rie and Vanessa Bell. 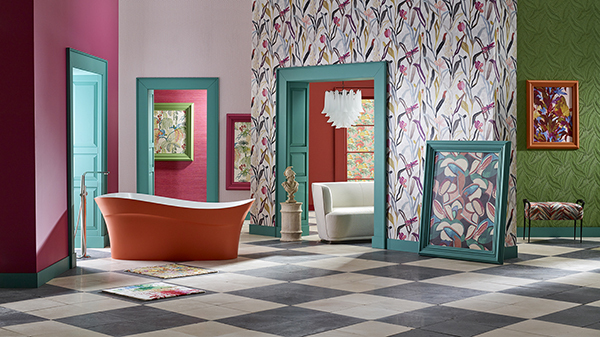 Zoffany looks to 20th-century design influences and McKinney Gainsborough salutes designs which graced RMS Titanic. Colefax and Fowler honours design legend Jack Lenor Larsen while Watts of Westminster looked to one of their founders, Sir Giles Gilbert Scott. More show-stopping curated edits include those from Nina Campbell who transformed her showroom into a decorated apartment and GP & J Baker who teamed up with interior designer Ben Pentreath. Creating a home has never been more important as a means to influence your own world in your own way. Many of us want to disconnect and recharge and it is hugely empowering to create rooms where we can reflect and retreat from a fast-paced life. The bathroom has moved on from being a purely functional space to being a place of relaxation, inspired by natural beauty and colour. Create a sanctuary that seamlessly offers a visual connection between the bedroom and the bathroom. 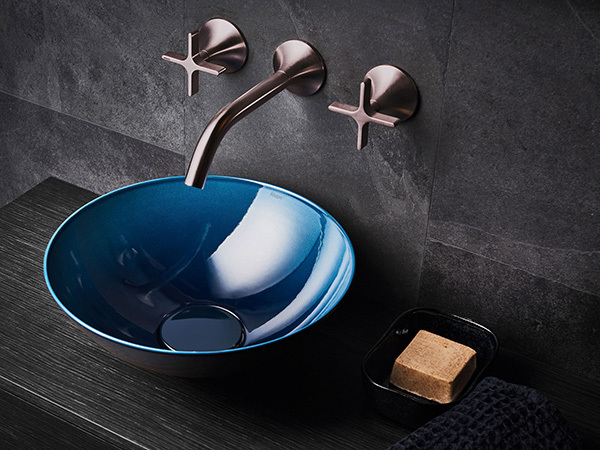 This graceful ‘Aqua’ basin from Alape at West One Bathrooms (shown in deep blue) is inspired by the nuances of water. 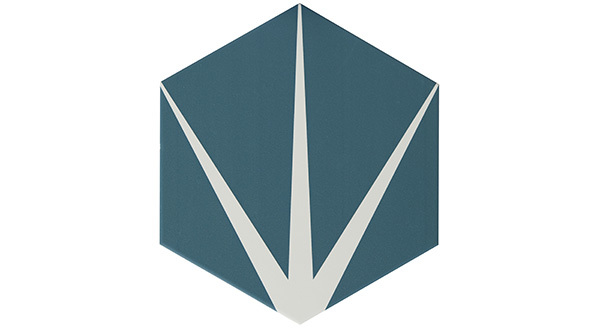 The high-gloss glaze gives it a visual depth and ensures that every one is unique. Or sink into a deep ‘Pescadero’ bath by Victoria + Albert Baths (shown here in RAL matt salmon orange). Inspired by the sea, it features a distinctive wave-shaped rim. Don’t skimp on comfort either in these newly-imagined spaces. Embrace soft materials like this tactile ‘Tricotage’ and ‘Tricotage Rayé’ fabrics from the new collection by Dominique Kieffer at Rubelli/Donghia or use ‘Lily Pad’ porcelain tiles by Artisan of Devizes that feel delightful underfoot (shown here in admiral). 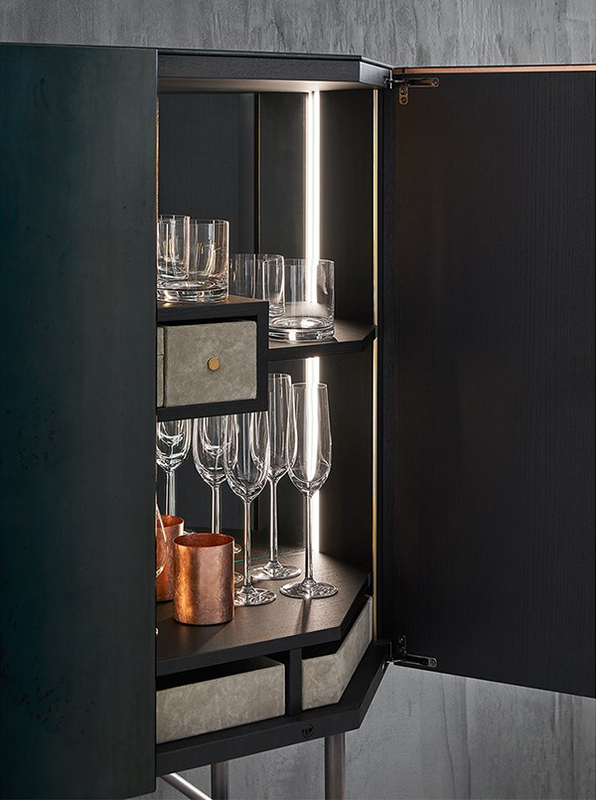 This ‘Misty Venice’ bar by Gallotti&Radice is shaking up cocktail hour with a dash of contemporary elegance. 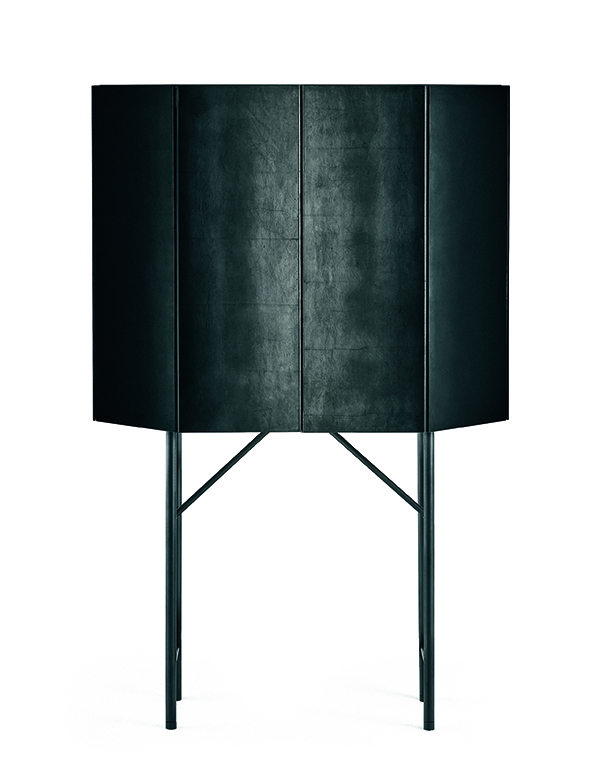 Open the lacquered ash doors to reveal a mirrored backboard and glass shelving. This year marks the 100th anniversary of the founding of the Bauhaus art school – a landmark that many view as the true birth of modern design. Several brands are celebrating with collections that show how its influence still shines today. 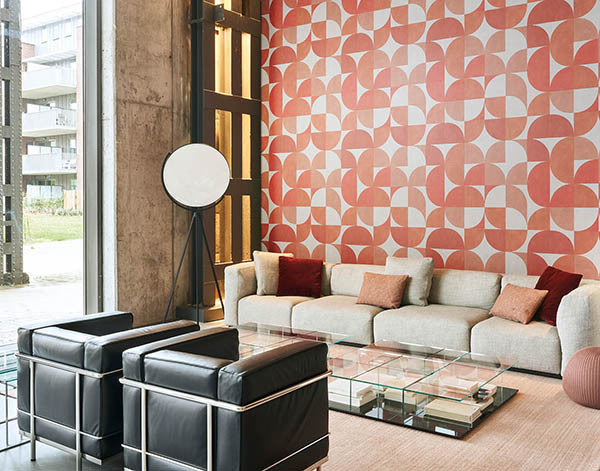 Arte’s ‘Odeon’ wallcovering (pictured top) has a bold pattern with blocks of circles that’s based on a functional and minimalist design from the Bauhaus period. With a similar robust, architectural feel to Arte’s wallcovering, ‘Abstract 1928’ fabric from Zoffany (pictured centre) is part of the new Icons collection that pays homage to the 1920s, including the Bauhaus; the printed linen is available from Style Library. 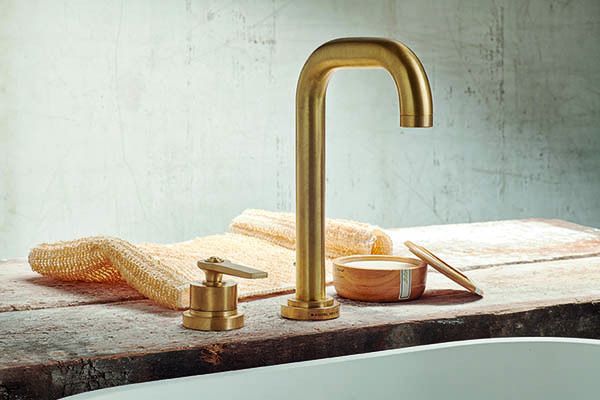 Samuel Heath’s ‘Landmark’ taps (pictured bottom); shows the same sense of harmony between form and function that the Bauhaus masters strived for; it’s shown in an urban brass finish.